NIST's compact gyroscope measures rotation by analyzing patterns of interfering matter waves in an expanding cloud of atoms transitioning between two energy states. Each atom's speed determines both its final position in the cloud and the size of the rotational signal that shifts the interference patterns. Thus, rotations generate interfering bands of atoms across images of the final cloud. The color coding indicates how much the interference patterns shift in radians, the standard unit of angular measure. The orientation of the interfering bands (horizontal in the image) indicates the rotation axis. The rotation rate, determined by an analysis of the band spacing, is 44 milliradians per second. As a bonus, the NIST gyroscope can also simultaneously measure acceleration. A combination gyro/accelerometer enables navigation by "dead reckoning," without reference to external landmarks or stars. The NIST gyro's glass atom chamber is just 3.5 cubic centimeters in size. The entire experimental setup, including low-power lasers and optics, is currently tabletop sized, but NIST researchers aim to shrink the whole apparatus down to a portable cube about the size of a mini refrigerator. Described in Applied Physics Letters, the NIST gyro is an atom interferometer. It is based on an expanding cloud of laser-cooled atoms, a technique originally demonstrated at Stanford University in a 10-meter-high "fountain" of atoms. 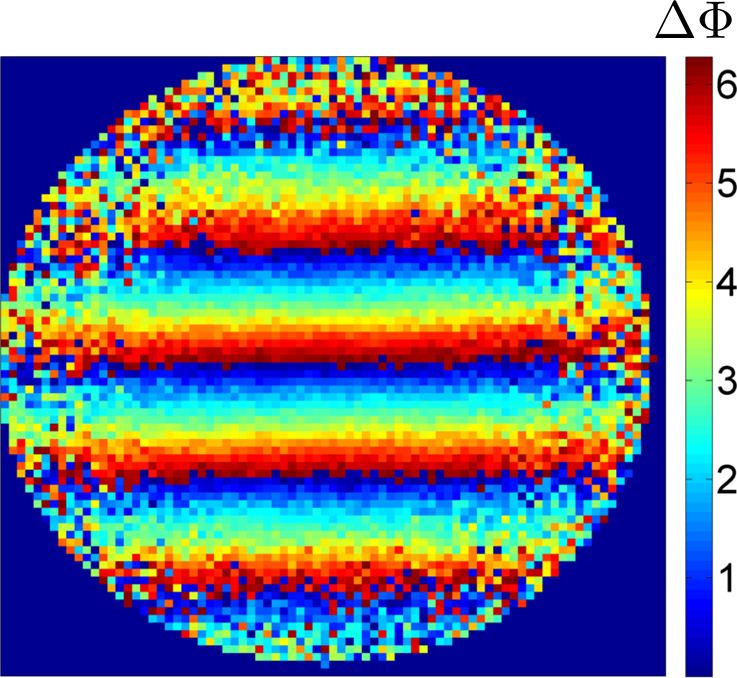 Traditional optical interferometry involves combining or "interfering" the electromagnetic waves in light and then extracting information about the original light paths from the resulting wave patterns. Similarly, atom interferometers—taking advantage of the fact atoms act as both particles and waves—interfere these waves to measure the forces on atoms. When atoms speed up or rotate, their matter waves shift and interfere in predictable ways, visible in interference patterns. "Usually, a combination gyroscope/accelerometer requires two separate sources of atoms," project leader Elizabeth Donley said. "The NIST version gets both signals simultaneously from a single expanding cloud of atoms, an approach that may ultimately lead to dramatically simpler devices."